Just like us, pets are at risk of food poisoning. If you’re a pet owner, you probably treat your furry friend like a family member. And the last thing you’d want is for your pet to suffer from a foodborne illness. Wash your hands for 20 seconds with soap and warm water before and after touching pet food. Clean pet food and water dishes after each feeding. Scoop food out of bags/containers with a clean scoop. Throw away spoiled or old pet food in a tied plastic bag. And, of course, stay abreast of pet food recalls. If your pet’s food has been recalled, take quick action to discard all of it — from your pet’s food bowls and your supply. Sometimes, though, pets are carriers without showing symptoms. They shed the pathogen in their stools or harbor it in their saliva or on their fur. And that’s why it’s important to remember you can become sick from tainted pet food, too. 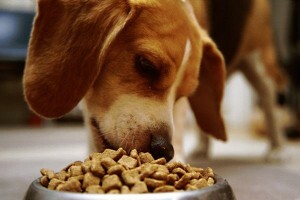 Humans are at risk when they handle containated pet food or have contact with an infected animal. The best way to protect yourself? Diligent, thorough hand washing after touching pets, serving pet food, or handling pet waste. If you become sick and suspect food poisoning is the cause, seek immediate medical attention. If your cat or dog is showing symptoms of a foodborne illness, call your veterinarian right away for immediate examination and treatment. Statistically speaking, we don’t have an accurate idea as to how many pets get sick from contaminated pet food each year. It simply isn’t monitored. There are approximately 70 million dogs and 74 million cats in the U.S. (in homes; not including shelter animals). Applying the Centers for Disease Control statistic that 1 in 6 people become ill from foodborne illness each year, it’s estimated that 11,600,000 dogs and 12,300,000 cats per year get sick from an illness related to pet food. Has Your Pet Suffered a Foodborne Illness? If so, we’d appreciate you sharing your story with us. Stories help our supporters learn best. Your personal experience could be just the thing someone else needs to provide insight, offer comfort, and inspire positive action. Please reach out to Stanley Rutledge, Community Coordinator, at srutledge@stopfoodborneillness.org to share your story.